Goa became a Portuguese stronghold in the 16th century and a flourishing centre of Christianity. The Virgin Mary has long been revered there as a saviour from disasters and protectress of seafarers. 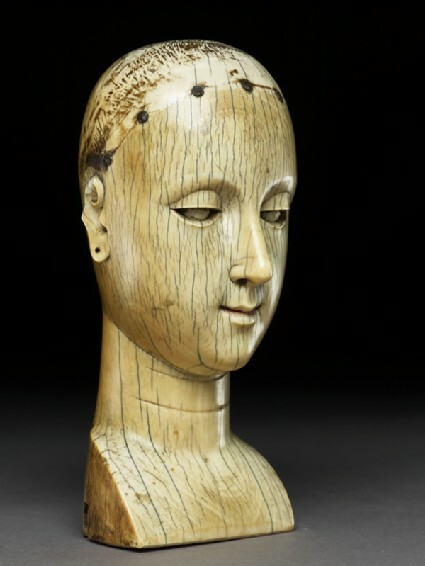 This finely carved head is of a type also attributed to Far Eastern Catholic settlements such as Macao or Manila. Bequeathed by Major Thomas Bouch, 1963. In the 16th century the Portuguese became the first Europeans to establish themselves in India, controlling their Eastern trading empire from Goa, on India’s west coast, which they had captured in 1510. The resident Portuguese intermarried freely with the local population and zealously converted them to Catholicism. The old town of Goa rang with the bells of numerous churches, monasteries, convents and seminaries, and pilgrims gathered at the shrine of the great missionary St. Francis Xavier (d.1552). Long after the decline of Portuguese power, Goa’s Christian culture has flourished to the present day. Among local worshippers, themselves former Hindus, images of Jesus and Mary were much in demand. The Virgin in particular was revered as a saviour from disasters and protectress of seafarers. Figures in wood and ivory were at first imported from Europe but later produced in considerable numbers by local craftsmen, in some cases with distinctly Indian iconographic features. This finely carved head of Mary is of a type that has also been attributed to Far Eastern Catholic settlements such as Manila and Macao. Her head which shows less patina at the top, would originally have been adorned with a suitable headcovering. 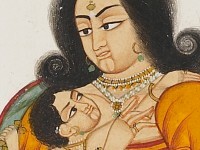 Traces of red colouring remain on the lips. A comparable Goanese head is in the Prince of Wales Museum, Bombay (Desai, loc.cit. ), and other examples are in private collections.